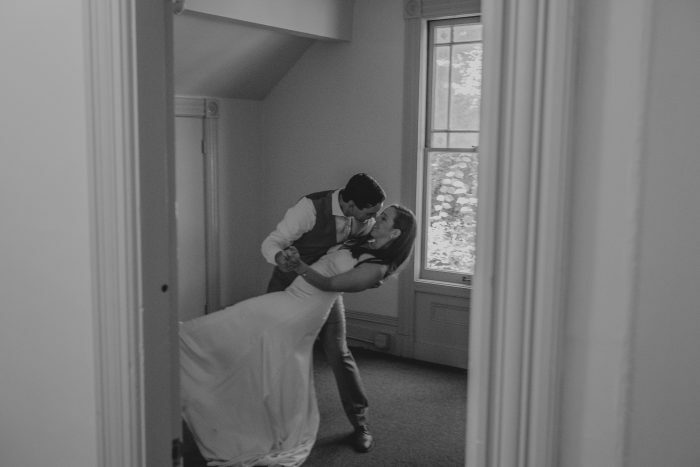 Our favorite moment of the day was practicing our first dance before our ceremony. 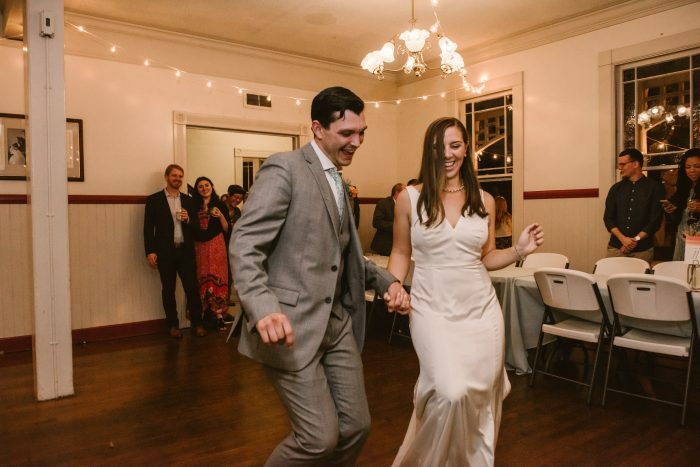 We spent weeks choreographing and practicing our first dance to “I Found You” by The Alabama Shakes, and practicing it together before everything got started was such a sweet, fun, special way to connect, just the two of us, before being surrounded by friends and family. Dancing with our friends and family! During our last song, “This Will Be” by Natalie Cole, one friend started a big dance train. ALL of our friends and family joined! It was a magical way to end our night with everyone. My good friend read a poem during our ceremony, as poetry and literature are a huge part of my life. Jerry wore a Knights of Columbus pin to honor his family and in particular his grandfather. We had a custom-made guest books with compiled poems, including a poem by me about our relationship. Guests signed next to a poem they connected with. 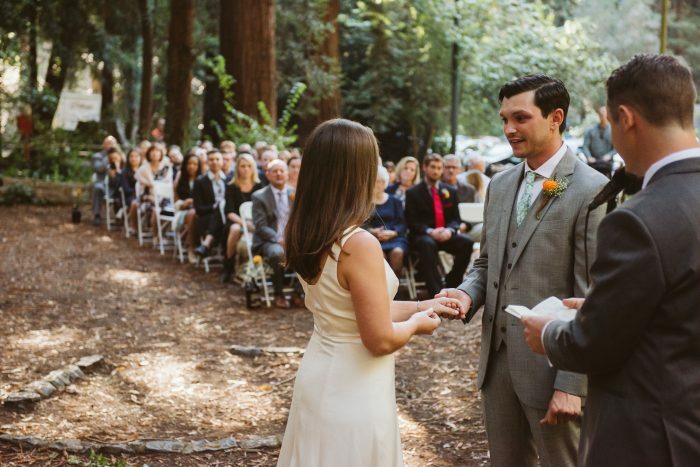 We also had a friend perform our ceremony, so it was extremely personalized. My friend did a reading during our ceremony, as well. We also had “his and hers” cocktails with special names — “The Katz Meow” and “The Greatest Showman.” Finally, we had photos of us together and growing up scattered throughout our venue. We will take a honeymoon next summer. We actually loved planning our wedding together. I took care of a lot of big-picture ideas and Jerry helped with a lot of smaller details, such as the favors and cocktails. One of our favorite parts was planning our choreographed dance. We are loving newlywed life! We are looking forward to buying a home and starting a family in the next couple of years. This was right after our first look. We were so excited for the day! 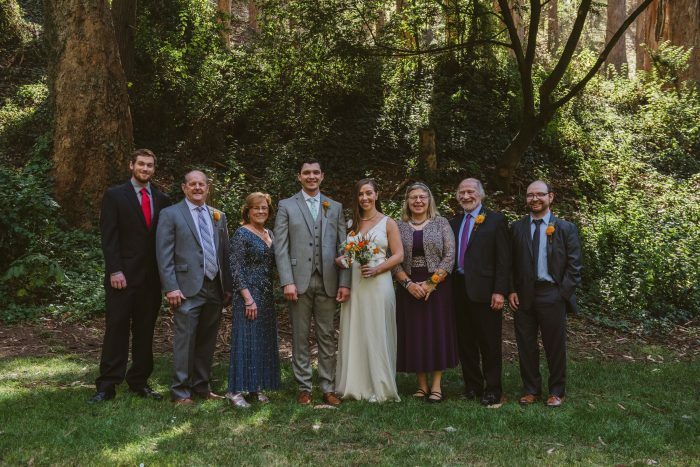 We wanted our ceremony to feel really intimate, so we opted to forego a wedding party and just had our immediate family members walk down the aisle with us. 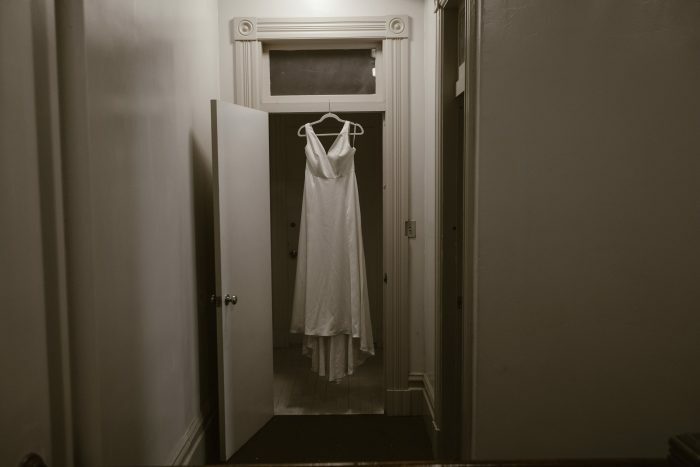 I loved how simple and elegant my dress was. It’s from the (now retired) J.Crew bridal line. 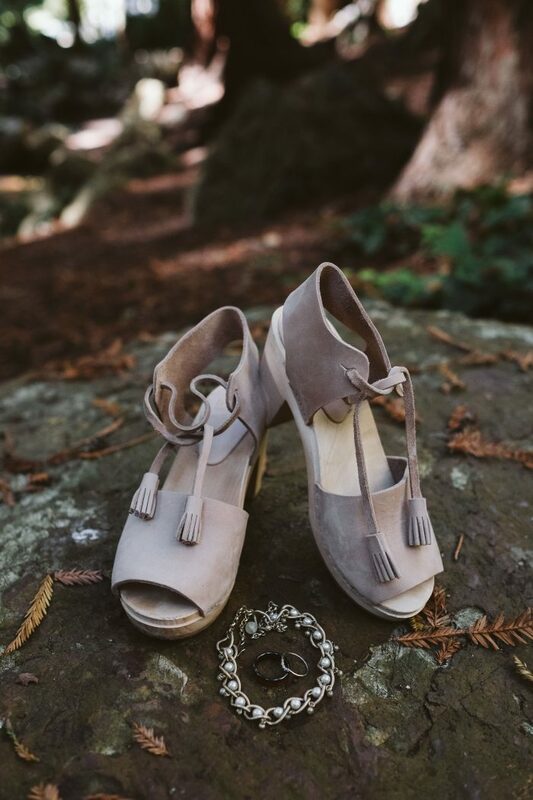 The rings are at the bottom of this picture — but I’m more interested in showcasing my beautiful wedding clogs! Our ceremony was beautifully personal and intimate. We loved having our friend perform the ceremony! With the help of my best friend and her girlfriend, I did all of the flowers for our wedding. 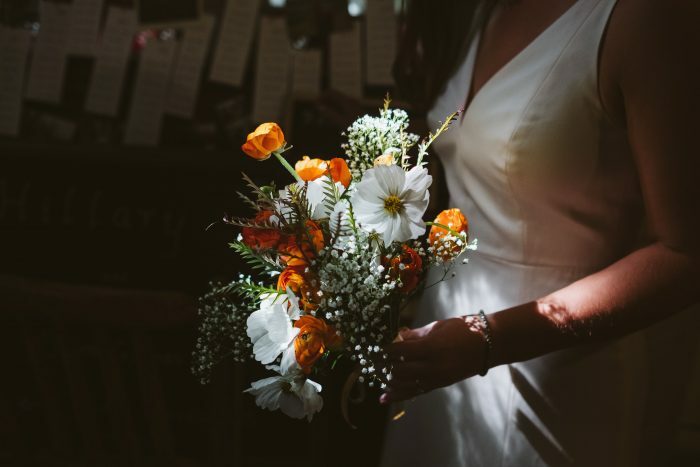 I love the wildflower-esque look of my bouquet, and the lighting of this photo is gorgeous. 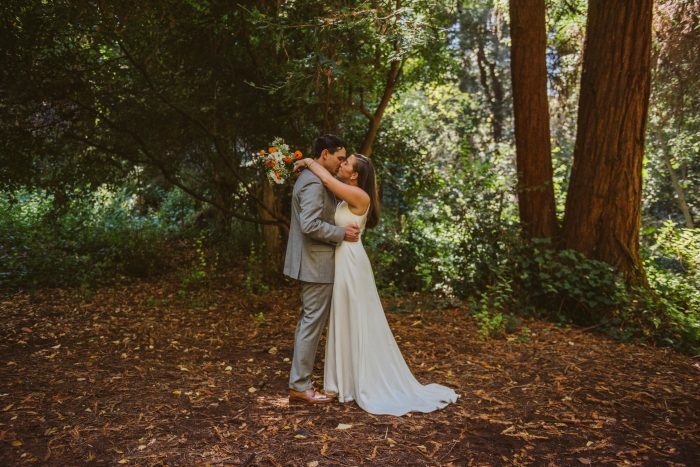 The Trocadero Clubhouse at Stern Grove is a very DIY wedding space, but we loved how personal we were able to make it because of that! Our first dance practice before our ceremony and everything else. I love the quiet intimacy of this photo. 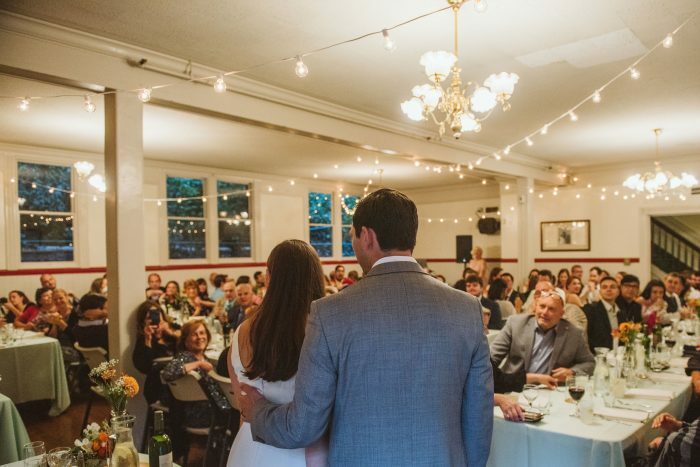 This is a moment from our first dance — it captures how much fun we had on our wedding day! We enjoyed every minute.